The earliest systematic description of the skeletal system appeared (c. 180) in the writings of Galen, which served as the unchallenged basis for the anatomical instruction until the sixteenth century. Galen commented on its protective and supportive role, noted that bone was composed of a hollow marrow, and, based on its color, believed that bone was made from sperm. Supported by his dissections of humans (and not Galen’s apes), Andreas Vesalius, in his classic work, De humani corporis fabrica (1543) corrected Galen’s many erroneous descriptions. By the eighteenth century, the human skeletal system was accurately described. Animals have either exoskeletons or endoskeletons. Exoskeletons, commonly referred to as shells, protect their wearer’s soft tissues against predators, provide support for these tissues, and serve as an attachment for muscles used for locomotion. In addition, exoskeletons may be sense organs, play a role in feeding and elimination, and, in terrestrial animals, provide a barrier against desiccation. Most shell-forming organisms made their appearance during the Cambrian period (542–488 million years ago), when there was a sudden change in the ocean’s chemistry. The chemical composition of exoskeletons differs among species: In insects, spiders, and crustaceans, exoskeletons contain chitin, a glucose polymer similar to cellulose. In mollusks, calcium carbonate provides hardness and strength to the shells, while in microscopic diatoms, silica (silicon dioxide) influences the cell’s float/sink equilibrium. When rigid exoskeletons are outgrown, a new one is grown below the old one, which is then shed (molted). Endoskeletons are harder than exoskeletons and allow room for the growth of larger animals. They provide support—most notably in sponges and starfish, which would be shapeless in their absence—protection, and aid in the movement of their muscles of locomotion. The skeletal system of vertebrates consists of bone and cartilage. In mammals, the bones of the endoskeleton store calcium, and bone marrow is the site of the production of red and white blood cells. Chemically, bone is composed of calcium hydroxyapatite (providing rigidity) and collagen, an elastic protein. There are 206–208 bones in adult humans, while estimates in newborns range from 270–350. SEE ALSO: Insects (c. 400 Million BCE), Leonardo’s Human Anatomy (1489), Vesalius’s De humani corporis fabrica (1543), Blood Cells (1658). 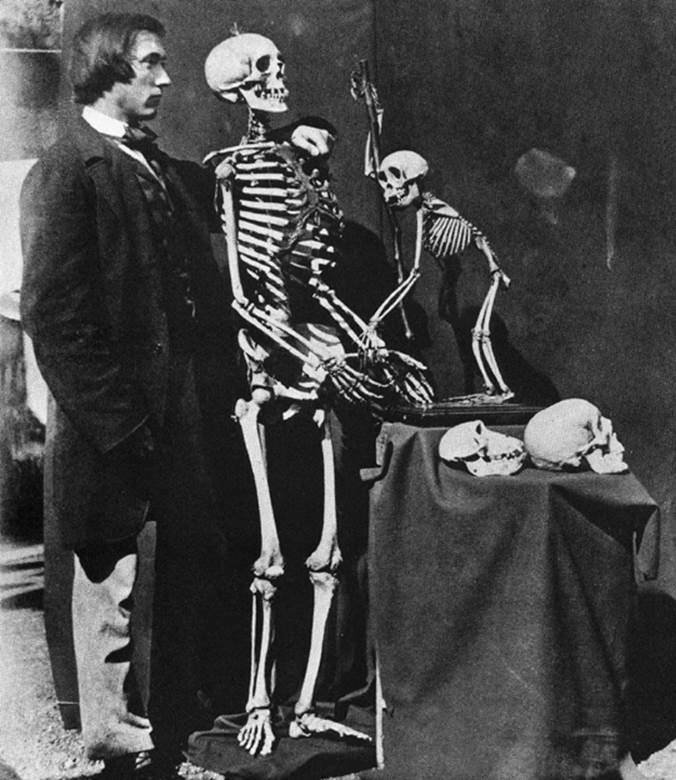 An 1857 photograph of a human and monkey skeleton with Reginald Southey (1835–1899), English physician and lifelong friend of the photographer, Charles Lutwidge Dodson, a.k.a. Lewis Carroll (1832–1898).